IP Internet Protocol: A set of communication protocols used for the internet and similar networks. HTTP Hyper Text Transfer Protocol: Used by Web Browsers and Web servers to exchange files through the WWW and intranets. HTTPS HTTP over SSL: A secure form of HTTP that uses SSL to encrypt data before it is transmitted. 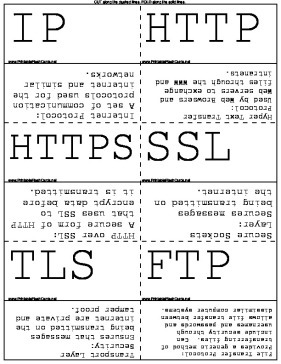 SSL Secure Sockets Layer: Secures messages being transmitted on the internet. TLS Transport Layer Security: Ensures that messages being transmitted on the internet are private and tamper proof. FTP File Transfer Protocol: Provides a generic method of transferring files. Can include security through usernames and passwords and allows file transfer between dissimilar computer systems. TFTP Trivial File Transfer Protocol: Similar to FTP. Lets you transfer files between a host and an FTP server. SFTP Secure File Transfer Protocol: A file transfer protocol that uses SSH to secure transfer data. SCP Secure Copy: Associated with Unix/Linux networks and used to transfer files between systems. SMTP Simple Mail Transfer Protocol: Used to route electronic mail through the internetwork. IMAP Internet Message Access Protocol: An e-mail retrieval protocol designed to enable users to access their e-mail from various locations without the need to transfer messages or files back. POP3 Post Office Protocol 3: Part of the TCP/IP protocol suite and used to retrieve e-mail from a remote server to a local client over a TCP/IP connection. DHCP Dynamic Host Configuration Protocol: A method for automatically assigning addresses and other configuration parameters to network hosts. DNS Domain Name System: A system that is distributed throughout the internetwork to provide address/name resolution. NTP Network Time Protocol: Used to communicate time synchronization information between systems on a network. NNTP Network News Transport Protocol: The most widely-used protocol that manages notes posted on Usenet Newsgroups. LDAP Lightweight Directory Protocol: Used to allow searching and updating of a directory service. SNMP Simple Network Management Protocol: A protocol designed for managing complex networks. Telnet Remote Terminal Emulation: Allows an attached computer to act as a dumb terminal, with data processing taking place on the TCP/IP host computer. SSH Secure Shell: Allows for secure interactive control of remote systems. TCP Transmission Control Protocol: Provides services that ensure accurate and timely delivery of network communications between two hosts. UDP User Datagram Protocol: A host-to-host protocol like TCP that does not include mechanisms for ensuring timely and accurate delivery. ICMP Internet Control Message Protocol: Works closely with IP in providing error and control information, by allowing hosts to exchange packet status information, which helps moving the packets through the internetwork. IGMP Internet Group Membership Protocol: A protocol for defining host groups.